Abstract: Frostytech's test bench this week is AVC's sleek dark chrome Black Samurai heatsink - one of the first CPU coolers to boast Intel socket 775 and socket 1366 processor compatibility. 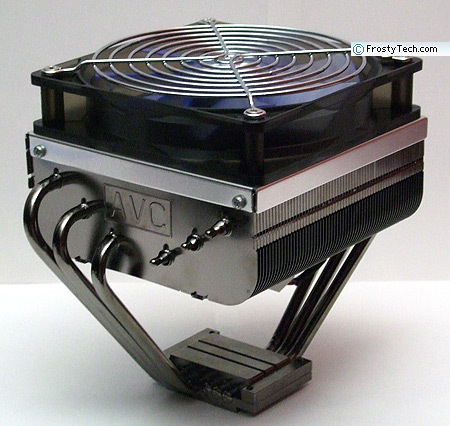 Readers frequently write into Frostytech to ask whether one style of heatsink or another is the best. The answer is actually really straightforward - you can't tell how a heatsink will perform just by looking at it. Anyone who gives you advise based on appearance, forum consensus or brand loyalty alone may actually be doing you a disservice. Read a review, here or at another site with a reputable test scenario. Okay, on Frostytech's test bench this week is AVC's sleek dark chrome Black Samurai heatsink - one of the first CPU coolers to boast Intel socket 775 and socket 1366 processor compatibility. Of course AMD users (there are still AMD users right?) can install it on socket 939/AM2 chips too. The AVC Black Samurai heatsink packs in a 120mm PWM fan which scales from 800-2000RPM, exhausting air downwards towards adjacent motherboard components like passive MOSFET and Northbridge heatsinks. Standing a good 150mm tall on six 6mm diameter heatpipes, the 760gram Black Samurai is a big cooler. For a little added visual appeal, the entire Black Samurai has been dark nickel plated. One of the important aspects of a heatsinks' design can be the plenum space behind the fan. A plenum is basically a bounded space intended to contain air at a positive pressure. If the space is too small, air may not flow through all areas of the cooling fins and hot spots can develop. To that end, AVC have stamped out the aluminum fins with a slight curve that creates an even void and helps to evenly spread out air flow. We here at Frostytech tend to prefer natural metal finishes,i n our experience heavy bright or dark nickel plating can hinder thermal performance to a very minor degree. The upside to plating a heatsink is corrosion mitigation and the filling of small voids between fin and heatpipes, for example. The nickel plating is also pretty hard, so it's more difficult to scratch the copper base over time. The AVC Black Samurai heatsink ships with brackets for LGA775/1366 and AMD K8 processors (754/939/940/AM2 respectively). 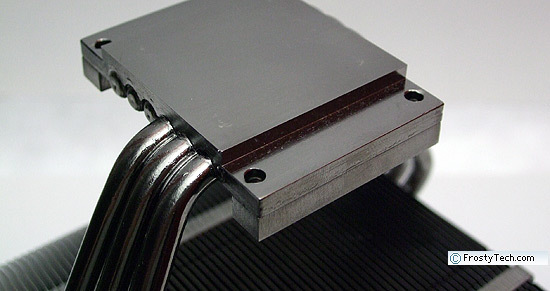 The Intel socket 775/1366 clips use metal back plates and spring-tensioned machine screws to lock the heatsink into position. 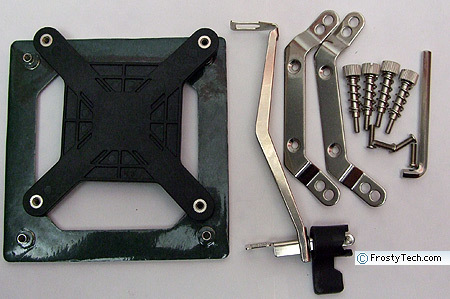 Because of the overhang of the aluminum cooling fins as small Hex key is supplied to tighten the thumbscrews fully. 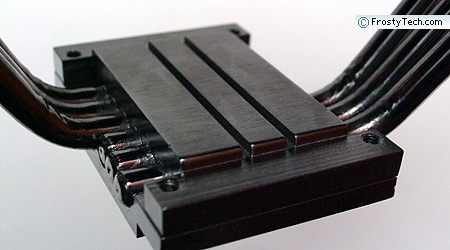 The AMD Athlon 64 clip works with a modified spring clip that attaches to the lugs on the AMD heatsink retention frame. A cam lever at one end of the clip applies pressure to the heatsink base directly. The AMD clip is tool free, but the metal is thin and tends to bend towards one side or another after clamping pressure is applied. 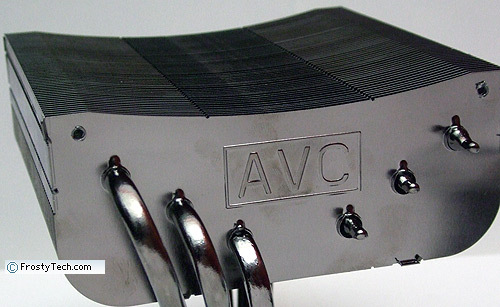 The AVC Black Samurai heatsink has a surface roughness of approximately 16 microinches, which is considered good. The base itself has a smooth sanded finish and is flat in both axis.